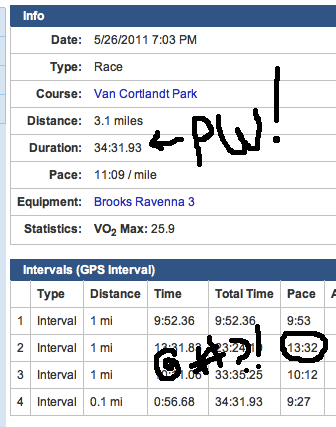 As some of you will remember, I'm haunted by the masochists of the Van Cortlandt Track Club and their stupid-hilly homeland in the Bronx. So when they announced the dates of their 5k summer series, I knew I'd be there. I didn't want to, but I knew I would. It was against my better judgment, but I couldn't resist. Against my better judgment, I took the subway up to the Bronx last Thursday. Well, almost to the Bronx. I accidentally got off the subway too soon, so my warm-up was 2m instead of the planned 1m. It was hot out. Hotter than usual. I drank an entire bottle of water while warming up, and the sweat was dripping off of me before the race even began. That's metaphorically hot, right? Just kidding. Only literally. The heat wasn't an issue, though. The hills were. As the race director was giving us a last-minute overview of the course, he mentioned that we'd make a turn after a named hill... I don't remember its name, but I have a thing about named hills. I don't like them. If it's big enough to get a name, it's big enough to intimidate me. Oh, and also my laziness was an issue. I'm not usually an afternoon runner, so it was different, in a bad way. I let myself walk, too much. Each and every mile was slower than my usual 5k pace, and the second mile was a miserable "am I even running?!?" 13.5 minute mile. I'm not even going to pretend like I won't be back to the park after this. I'm registered for the 10k Riverdale Ramble (link = last year's race report) this weekend. And then, of course, I'll be back for another summer series 5k. You see, I must avenge my time. Everyone needs a personal worst, sure, but now I have a standard. I will beat this time.